Lately, at work, I have spent more time with paper than people, which has contributed to a resurgence of my stress and anxiety. Today, though, I was able to put the paperwork aside and spend some time with the guests at the day shelter for homeless men where I am employed, and as always, it was time well spent. Also, true to form, one of the men reminded me why I refer to them as the finest gentlemen in all of Louisville, thanks to a kind gesture that I had the pleasure of witnessing. As I made my way through the shelter, I heard a familiar voice call out my name, and I smiled broadly when I saw Sherman approaching me. Sherman is a former guest at the day shelter who now lives in transitional housing, but he still returns to the day shelter on occasion to help with odd jobs and projects. Sherman spent most of the day helping to deliver furniture to several other guests who recently moved into their own apartments, and he brought his trademark positive attitude and strong work ethic with him. He also brought his kind heart. After we exchanged pleasantries and chatted for a bit, Sherman lowered his voice and discreetly nodded in the direction of a young man standing nearby and asked me, “Can you find a pair of pants and maybe a belt for him? He can’t wear what he’s got on, and he doesn’t got any other clothes.” I quickly glanced over and recognized the young man as a guest who comes to the day shelter on a fairly regular basis, and I know that he does his best to manage a mental illness and life on the streets. I immediately understood Sherman’s request, as the young man was wearing flannel pajama pants on another cold winter day here in Kentucky. Fortunately, I was able to find the requested items, and I watched as Sherman handed the bag containing the pants and belt to him. As the exchange was made, I overheard Sherman quietly say some words of encouragement to the young man, who responded with a big smile and genuine words of thanks, before heading to the bathroom to change his pants. When Sherman returned to where I stood, I thanked him. Sherman quickly deferred my thanks by saying, “You don’t need to thank me. I just did what was the right thing to do. I try to look out for people.” As I watched him head out the front door to go home, the young man he helped emerged from the bathroom, still smiling and now wearing the jeans and belt, I thought to myself how often we pass up opportunities to do the right thing and look out for others, because we are in a hurry, too busy, too preoccupied with our own lives to notice the lives of others, assume if the person needed or wanted help then they would ask for it, think that someone else should or could help, and a thousand other excuses. I am grateful to Sherman for his reminder to do the right thing and look out for others. No excuses. Just one thing each day. . . Thank you, and Sherman and the other gentlemen never cease to amaze me! Thank you very much! It truly was lovely to see. You are a good soul to do what you do! Thank you very much, but I like to think that I am surrounded by beautiful souls who are among my greatest teacher’s! I do not know about that, but I thank you kindly! It’s easy to make a hundred excuses,I’m very good at that, but it often doesn’t take much to brighten someone’s day. Thanks for a great post. You are so welcome, and I thank you for your kind words. One of the many lessons the men at the day shelter have taught me is that the little things, such as a smile or a kind word, mean the most. We all have time to do at least those two things. Reblogged this on 100% Интернет Маркетинг®. A fantastic post. In my experience, people often don’t ask for help. I don’t and if someone does, it means they are desperate. That said, we don’t always have the means ourselves and there is so much need. Yet, that doesn’t mean that there’s nothing we can do. If we’re not financial, perhaps we can give our time. Thank you so much! I agree that we can all find some way to give of our time, talent, and “treasure”, be it in big or small ways. Many thanks, and I am just so grateful that I have the recipient of these lessons! I work with low-income youth. One day, at school, a young man asked me for some help. He was shy to ask, and I knew it was hard for him. I ran to my resources, pulled together what I could, and asked others for more help. The other day I saw him. He had one the clothes others had donated, the shoes he so desperately needed (he had been wearing his dad’s) and the clean, new winter coat a friend of mine had went out and bought for him. I don’t write this to boast of my own goodness, I write it to boast of God’s goodness. I see so much love and caring gestures from others, that it swells my heart and makes me remember that there are others in the Life of this World that care as much as I do, and can use their time and money to care for others. This world (and that young man) are better because of them. I tell him often, you are going through these struggles because it makes you stronger. And I know for a fact, that down the road, he will do the same for someone else. I appreciate you sharing your story, and I thank you for the work that you do with our youth! Kindness simply is an attitude not a job! I always love your posts!!! Thank you so much, and I couldn’t agree with you more about kindness being an attitude. It is one that I hope we can all adopt! You are so kind, and I would have to say that Sherman is the true role model. Sometimes we need inspiration. What counts is what we make out of this inspiration. Therefore you are a role model for sure. I am humbled by your praise, and I thank you! What we take for granted can make such a difference to some. Indeed it can, and it does! Sherman came to you in a beautiful reminder to adjust your focus. I also add that I do understand the frustration of spending days in ‘paperwork’. It can be a thankless task. I am glad that you were able to have some rewarding ‘people’ time later in the day. Elizabeth, I can always count on you to understand, and I thank you from the bottom of my heart! Thank you for that beautiful message. Little kindnesses go a long way. You are very welcome, and I agree! 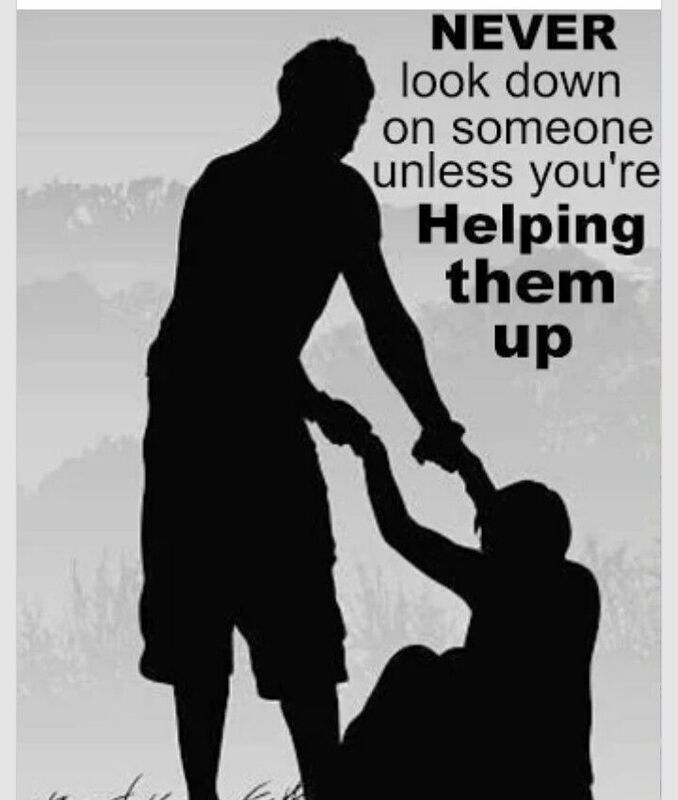 Good reminder for us all to lend a helping hand when we see it is needed. Most people are too proud to ask for help. Elaine, I greatly appreciate you sharing this post! How true, acts of kindness and doing the right thing do not happen as often as they should. Thank you for sharing Sherman with us! You are more than welcome, and thank you for letting me share his story! I used to be and officer on the board of “The Mustard Seed” here in town for over ten years. It was an organization like the Salvation Army, which was supported by all the churches in the county. I thoroughly enjoyed this service but due to so many dishonest people taking taking advantage of the limited resources and our decision to not take government assistance because of their control, and lack of contribution by the churches during hard times for everyone, it finally had to close it’s doors about two years ago. I don’t blame the churches because even church collections are down in this terrible economic failure. It’s bad but due to loss of income, 10% tithe of nothing is nothing. But as I look back it was probably because we on the board did not keep the churches informed as we should. And we also had some theft of clothing and money in our store, sadly even from volunteer workers. One thing I learned from this is that churches will not give until they see results and know their gifts are doing the good they intend it to do. I’ve always heard that we should not question the help we give as to how the money is used as long as we know it was the Lord’s Will. It’s between the person receiving the gift and God Himself if that person has lied to you and buys beer instead of food. Anyway, here’s a short story of one of many experiences I had while working there. An elderly black grandmother widow called us one cold winter day and said she needed some food. She sounded as if she was honestly hungry and destitute, although she was living in a substandard house she and her husband had been paying on for years. She lived in a really bad and dangerous neighborhood, but I told the Director I would take the two bags of food out to her in my pickup. After driving up and down the street in the dark, using my flashlight to find the house number, I pulled in the driveway. In my headlights I saw eyeballs looking out the window and two sets looking out the car window, parked in the driveway. I opened my truck door and grabbed two big paper bags full of groceries, and at the same time the house door swung open and the car door opened, and 7 kids came running at me, tore the bags from my arms. Grandmother was standing in the door yelling at them as they scrambled through the sacks looking for anything that wasn’t in cans. After they tore open everything and started eating the chips and things, grandmother came out to the truck to help me pick up what was left. She told me that these kids were her daughter’s kids from another state, who brought them to her house and left them, as she was homeless herself and could not support them. Five of these kids were sleeping with her and the two oldest were sleeping in the old car. None had had any food at all in a week and those in the house were sleeping with mice in the mattress. I went back to the Mustard Seed and told the Director to help her and if possible to find a place for the kids to stay until more could be done. Fortunately we now have a branch Salvation Army here in town now to take the place of the Mustard Seed, but they are barely surviving and not able to do near as much as MS. Thank you for sharing this story and for the work you do!